Rabbit’s House is a story that reminds us how each of us can sometimes be in need and without a roof over his or her head and how nice and important it is to help each other whenever such unfortunate situations occur. 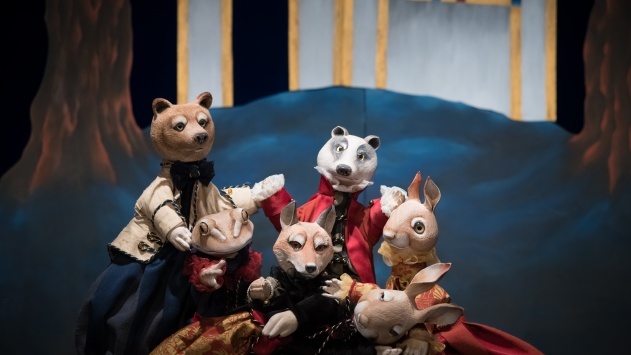 In our story Frog, Squirrel, Badger and Bear unite their forces to help Little Rabbit who has lost his home. With their affection, joy, determination and good-heartedness they help him to get rid of his bad thoughts and build a new house. Meanwhile Fox is hiding behind the bushes. She is not very keen on giving them her hand, because she is a sophisticated lady, yet she is quite curious at first and then envious too. She would like to have a little new house as well. Why are they building it for Rabbit and not for her? How could she get one herself? Perhaps she could use a little trick? Fox is really smart therefore she comes up with a rather unusual solution. But luckily enough the creatures around her are not so stupid either. Left all alone with her fraud, she is forced to shovel out all the dirt she caused. We all dream of having a safe and cozy nook, in which we would live peacefully and without worries. Some of us are lucky to have it, and the others are not. Sometimes things can go wrong, so even the lucky ones can lose their homes or they suddenly do not feel safe in them anymore. And the greatest luck when you are unlucky is when someone is willing to help you. The performance Rabbit’s House was conceived by three successful authors: award winning writer Anja Štefan, winner of the highest rank recognition in the field of illustration - the Hinko Smrekar Award - illustrator and designer Hana Stupica and award winning actor and director Martina Maurič Lazar who has already directed two successful performances for the LGL (Ljubljana Puppet Theatre) Four Black Ants and Tomorrow’s Party.